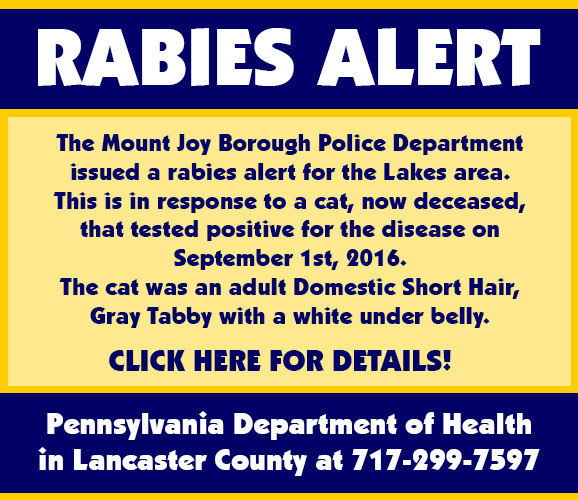 The Mount Joy Borough Police Department issued a rabies alert for the Lakes area. This is in response to a cat, now deceased, that tested positive for the disease on September 1st, 2016. The cat was an adult Domestic Short Hair, Gray Tabby with a white under belly. All residents and visitors in the Lakes area of Mount Joy should be aware that rabies is present in the wild animal population and domestic animals are at risk if not vaccinated. The public is asked to maintain a heightened awareness that rabies is active in the Mount Joy area. An animal with rabies could infect other wild or domestic animals that have not been vaccinated against rabies. All domestic animals should be vaccinated against rabies and all wildlife contact should be avoided, particularly raccoons, bats, foxes, skunks, otters, bobcats and coyotes. Rabies is a disease of the nervous system and is fatal to warm blooded animals and humans. The only treatment for human exposure to rabies is rabies specific immune globulin and rabies immunization. Appropriate treatment started soon after the exposure, will protect an exposed person from the disease. Persons who came in contact with the infected cat or have been bitten or scratched by wild or domestic animals should seek medical attention and report the injury to the Pennsylvania Department of Health in Lancaster County at 717-299-7597.